May not hold a candle to the newer, shinier graphic cards but a decent choice nonetheless. Pretty decent card and good price, think I'll go off though, hope prices to drop more. Bought this card a few months before, it's been very reliable. Worked quitely, efficiently reduced the heat in most of cases, and it could really push up my game settings to superhigh/high for all games I played e.g. borderland2, company of heros 2, civilization 5, XCOM: EW, Fallout 3 etc. I also hope prices will drop further, but I've noticed that some retailers have actually raised their prices back up since the initial reduction when GTX 970/980 was released. Waiting for GTX 960, should be release this month. Lets see how NVIDIA rip-off us with absence of AMD's new cards. Waiting for GTX 960, should be release this month. Lets see how NVIDIA … Waiting for GTX 960, should be release this month. Lets see how NVIDIA rip-off us with absence of AMD's new cards. like how they've ripped everyone of with the super competitively priced 970? like how they've ripped everyone of with the super competitively priced … like how they've ripped everyone of with the super competitively priced 970? Agreed the prices of the GTX970's basically took off where the 770's left off. That was a particularly uncharacteristic move, though a very pleasing one for the consumer. Cheaper manufacturing costs though so margins will still be very good. I think they saw an opportunity to re-exert their market dominance over AMD and it looks like it may pay off. Very disappointed with AMD in recent years it has to be said. 290/X are terribly designed cards, as ill thought out as the lamented 470/480 cards of Nvidia's from a few years back, hot and hungry for power. I fear the competitive pricing from Nvidia won't last long if AMD don't pull their fingers out soon. One of the shop staff at ocuk has said the amd price drops will hit the uk prices within a 1-2 weeks. I'd wait to see. AMD dropped the rrp in the US last week. Depending on how often you change components, but if buying now, I'd still consider gtx970 rather than this. We're finally seeing 4k monitors and TVs on the cheap and 760 won't cut it for that res, heck even a single gtx 970 will struggle. But a single 970 now and another one for SLI later (when you get that 4k goodness and when games have caught up with hi-res textures etc) may be a more sensible choice to avoid swapping the components out too often. Still a very hot deal, for those who don't need (or want to pay for) the bleeding edge of tech. Also great for people who wish to upgrade their existing 760 to SLI. Nvidia do free game promotions. Just that Amazon doesn't offer that offer on its website. Other online retailers offer free games with the newer Nvidia cards. I bought this card 7th august and paid £169.99. I decided on the GTX 760 for my first experience of pc gaming and haven't been disappointed. I got it quickly from amazon and its performed admirably ever since, I have played everything on its highest setting on 1920 x 1080 fully hd tv including the likes of Battlefield 4, Biohsock 1/2/3, Borderlands 2, Skyrim etc. I have confidence in it performing for the likes of Shadow of Mordor despite its extreme requirements. Its fantastically quiet and stays very cool. I would say this is a superb price. I bought this card 7th august and paid £169.99. 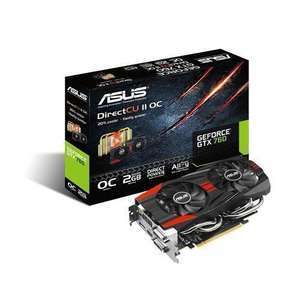 I decided on the GTX 760 … I bought this card 7th august and paid £169.99. I decided on the GTX 760 for my first experience of pc gaming and haven't been disappointed. I got it quickly from amazon and its performed admirably ever since, I have played everything on its highest setting on 1920 x 1080 fully hd tv including the likes of Battlefield 4, Biohsock 1/2/3, Borderlands 2, Skyrim etc. I have confidence in it performing for the likes of Shadow of Mordor despite its extreme requirements. Its fantastically quiet and stays very cool.I would say this is a superb price. It plays Shadow of Mordor without the textures pack just fine i tried it the other night on my Palit JetStream 760 and was great i would have to agree the 760 has been a fantastic card its quiet its fast and a 1080p it was a great choice but ive ordered a 970. It plays Shadow of Mordor without the textures pack just fine i tried it … It plays Shadow of Mordor without the textures pack just fine i tried it the other night on my Palit JetStream 760 and was great i would have to agree the 760 has been a fantastic card its quiet its fast and a 1080p it was a great choice but ive ordered a 970. Sweet! Glad to hear that, I really wanna buy the game but had reservations what with all this talk on its requirements. I was quietly confident the 760 would do the job. So without the texture pack did you still play it on high? And hows the game too? If you are happy with the price and you can pay for it. I dont so I wont. And dont forget nvidia will update GTX 9xx with 20nm tech, first quarter next year. If you are happy with the price and you can pay for it. I dont so I wont. … If you are happy with the price and you can pay for it. I dont so I wont. And dont forget nvidia will update GTX 9xx with 20nm tech, first quarter next year. Don't you mean "they might". Games like Titanfall, Watch Dogs, Shadow of Mordor and Wolfenstein all eat up graphics RAM. GTX 760 is a bit more power efficient and the card is usually smaller though. Anyone running 2 of these SLI? Any thoughts on doing so?